BOMB MAKING. Slow, close up, dolly shot of a pair of male hands soldering an electrical connection for a bomb. Shot in 4K, 10 bit. 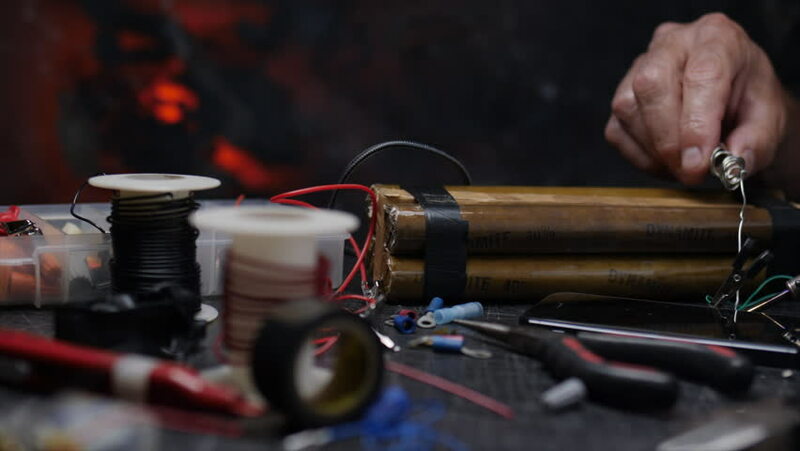 hd00:16TERRORIST CONSTRUCTS A BOMB. Slow, close up, dolly move out on a pair of male hands soldering electrical connections on the device. 4k00:271940s style period piece of revolver and stacks of cash in foreground with man in background making ledger entries using a fountain pen who stops to make a call on his rotary dial telephone. hd00:24Man holds and spins three fidget spinners on top of each other.